Creativity vents out our stress and our artistic skills are polished, giving birth to new ideas. Do-It-Yourself skills gives immense joy to our soul as there is feeling of ownership and pride. It encourages to use our leisure time fruitfully instead of wasting out for nothing. Today, we will discuss about decoration ideas of Mason jar. Mason jar is not a new thing. I have conceived artistic ideas to decorate them in style. They are mostly used as containers for preservation &for serving hot, cold drinks, ice-creams etc. We can give it more to Mason jar to beautify it at perfection running our imagination wild. 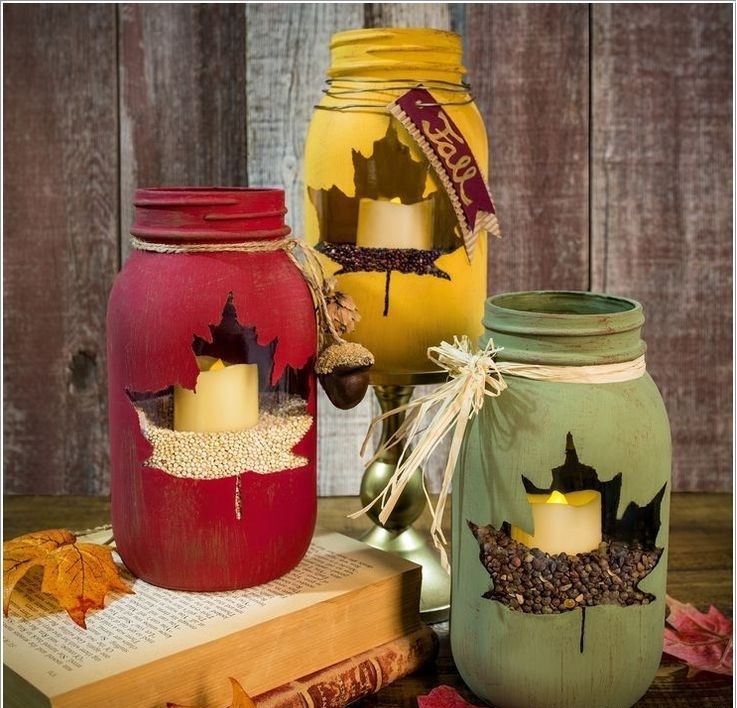 You can paint the Mason jar till quarter from base with attractive color of your choice, preferably with bright colors so that it refracts bright lights once votive candles are lit. If you are a lover of sombre, keep it original. Place votive candles inside the jar. You can place dry herbs underneath the votive candles to add fragrance and it can act as potpourri. Place it on your centre table, side table or corner table or at your favourite spot and enjoy the serenity of lights and mild fragrance. Beautify Mason jar by covering with glitter paper, choose the color you love to present for your valentine. Cut out into heart shapes in the mid portion of the cover of Mason jar and stick it with adhesive. Place led candle inside the jar. Even you can imprint the name of your valentine on the jar by arranging the letters of cut-out of glitter paper or you can use colors to paint the name of your love. If you want to make it a hanging piece, tie a holding ribbon on the neck of the jar. Pack it wonderfully and surprise your valentine on special day to give special effects to your relationship. God has gifted us with beautiful flowers around in multiple hues and its beauty is unique &unparalleled. Captivating them on special occasions by using Mason jar as flower vases to celebrate different occasions and events. Cut flowers & leaves with long stems, slit the base of the stem and pour water in jar to place the flowers. You can add colourful water to add beauty to the jar, homemade colors will save the life of flowers. Place at your favourite spot at home, office or at event venues. Mason jar can be used as indoor herb planter vases. It is easy to manage, without any extra efforts. Place them in your kitchen garden and the fresh herbs will add taste to your cuisine and herb infused fresh air to inhale. You don’t require lot of things to arrange. Layer the jars with some rocks, gravel or marbles in the bottom of the jars. There is no hole to drain excess water, so these items are essential for layering. Add potting mix, it’s a mix of peat and manure and is lighter in weight, so it is best for growing planters in jars. Transplant herbs or place seeds to germinate. Label the jars to identify the planted herbs. Place on your window sills where it can receive sunlight for few hours in a day or in kitchen garden. It is portable and easy to carry. Enjoy the herbs and decorate your home. Greenery add glory to our lives. During holidays, you can engage your child to DIY Piggy banks while teaching him about money and savings. This art will attract him/her more towards savings. Give them ideas but encourage them to paint the Mason jar with bright colors, depicting rainbow, birds, and nature’s delight, etc. Pierce a hole in the middle of the Mason jar cover and seal the lid. Child can craft more in different designs to gift their friends on birthdays with homemade gifts. Your child will cherish your idea, it will induce him to save more of his pocket money & will learn the value of money. In holidays, children can try their hands on creativity and decorate Mason jar with glitters, the color choice can be theirs or yours, as you wish. Spray glue on the jar and sprinkle glitters all over or you can roll over glitter carefully. You can mix two three shades of glitter or just one. You can use one glitter color for handles and another one for jar surface. Designing will look much better and it will give artistic and glamorous appearance. The children can display them on their desks or can use as lantern by placing led light inside. Serve colourful smoothies in Mason jar with attractive straws, allure your kids, hubby and guests. They will love to gulp and inviting hues instigate interests and serves as gastronomical delights. Old mason jars can be brought into use for makeup organiser. You can segregate makeup brushes into one jar, ear buds into another and so on. In ear buds jar, pierce a hole so that you don’t require to open the jar when you need to use ear buds. Place on your dressing table or in bathroom, wherever, it is convenient for you to use. You can use old or new ones for crafting an aquarium jar from Mason jar. You can keep small colourful fishes and place it on your table. Buy the things from Aquarium shop and decorate your Mason jar aquarium. Aquarium gives positive vibes and is good for the places where people dwell. You can craft Mason jar welcome sign by using tinted or painted Mason jar. Inscribe welcome sign on the jar and plant real or artificial plants, hooking them on the side wall of entrance.It can be even used to adorn homes, offices, events venues etc. I believe, you will love the suggestions suggested above and will love to indulge to boost your creativity and boost your morale. Your home will get a new improved look and visitors will be happy with your artistic efforts.